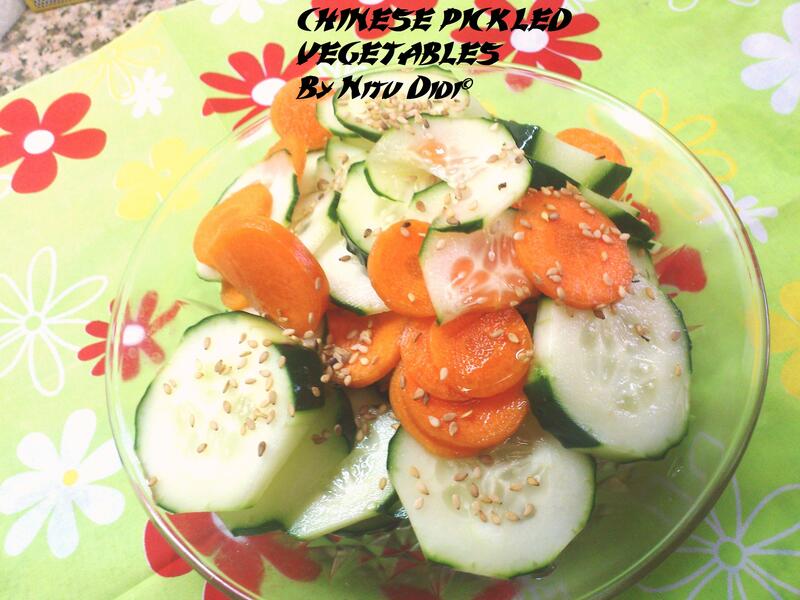 Chinese style sweet and sour pickled vegetables is a nice way to start a chinese meal or serve vegetables to fussy eaters. You can use almost any kind of crunchy vegetable for this such as cauliflower, cabbage, turnips, radish etc etc. This is easy to make and needs very few ingredients. Chopped seasonal fresh vegetables of your choice such as cucumbers, carrots, radish, turnips, cauliflower, etc. In a bowl mix rice vinegar, sugar and salt till the sugar is dissolved. If you want you can add a few drops of sesame oil , i did not add. Chop the vegetables into bite size pieces and place in a bowl. Pour the vinegar dressing on top and toss well. Sprinkle with toasted sesame seeds and serve or refrigerate for a few hours and then serve. This rice vinegar gives it the special taste but if you dont have any you can use white vinegar ( which is much stronger, so dilute it and then use it) or lemon juice. This entry was posted in Everything Vegetarian, Fusion, Gluten Free, Healthy Options, Indochinese, Jain recipes, Low Cost, Made in China, NO OIL RECIPES, Quick Recipes, Salads, Veg Starters, Vegan and tagged chinese, gluten free, jain, oriental, sweet n sour, Vegan, vegetables. Bookmark the permalink. Looking extremely good nitu infect I was looking for something like this so thank you for sharing . Hi dear thank you for your comment, i have already seen and subscribed to your blog…its nice! !